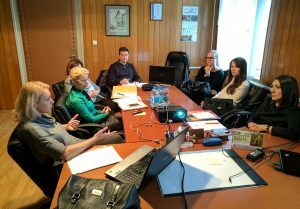 Within the project „Partnership for quality jobs and competitiveness“, the first working meeting for preparation of the Action Plan for Employment of the Municipality of Prnjavor for the period 2018-2020 was held. 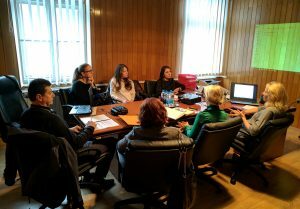 The working meeting was attended by representatives of the Municipality of Prnjavor, Employment Bureau, Center of High Schools „Ivo Andrić“, Trivas company and Eda. The participants discussed results of presented analysis of the labor market of the Municipality of Prnjavor, potential measures for employment, as well as methodology for preparing the Action Plan. The Action Plan for Employment of the Municipality of Prnjavor is basic instrument for implementation of the active employment policy and establishing an efficient system of labor market that defines priorities and objectives of the employment policy. The basis for preparing the Action Plan is the Employment Strategy of Republika Srpska for the period 2016-2020 and the Development Strategy of the Municipality of Prnjavor for the period 2012-2020. The Action Plan will include, among other things, a elaborated implementation plan for 2018 with defined programs, measures and projects to be implemented on territory of the municipality in order to achieve defined goals and sustainable increase in employment. The following activities related to preparation of the Action Plan will include defining objectives and measures for their implementation as well as elaboration of implementation plans. These activities will be conducted by a working group for preparation of the Action Plan, which consists of members of the Partnership for employment of the Municipality of Prnjavor. Participants of the meeting expressed their belief that preparation of the Action Plan is a significant step in implementation of the project’s goal – 75 trained persons, 50 employed persons, as well as increased employability of 150 persons from the Municipality of Prnjavor. Also, that will contribute to harmonization of supply and demand at the labor market in Prnjavor.